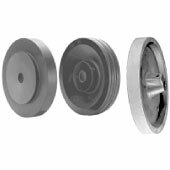 Encoder measuring wheels allow rotary encoders to measure linear distance. Fast, easy attachment to several Dynapar brand encoders. Available with high performance phenolic material with high temp range. Pivot Mount Pressure should be applied to the encoder wheel to prevent slip.